The topographical position of the new building at the sandstone cliffs around the Comturey Tower resulted in a narrow but very long roof with an approx. 1 m high parapet running along the entire front edge. This parapet and the adjoining canopy are wood panelled. 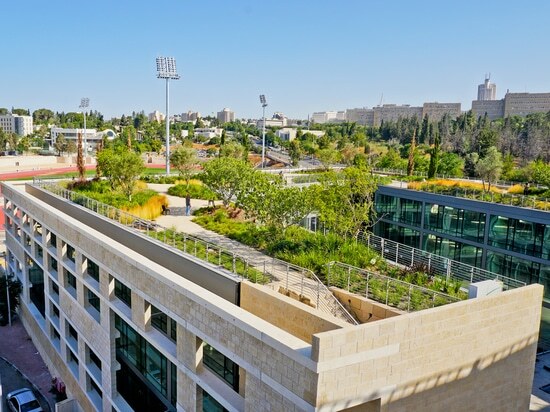 They were specifically designed without an incline due to the water retention irrigation system required for the intensive green roof. The roof area does, however, require a reliable drainage system and one that can function over a distance of 40 m given that the roof can only be drained along the two narrow sides. The special hillside location added an extra and unusual aspect: the weight of the building including the green roof had to be calculated such that the building could withstand the slope pressure. Therefore, the green roof could not be too heavy or too light. 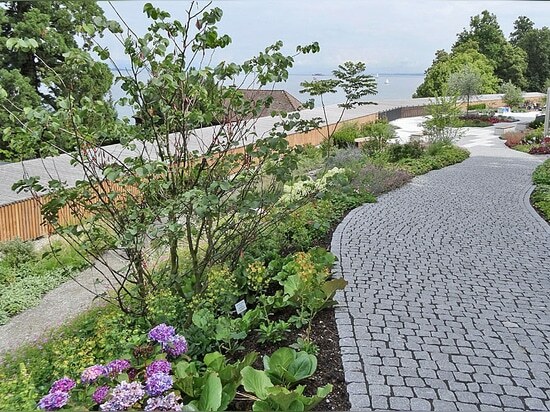 The right solution in this case was the ZinCo system build-up “Roof Garden“ in conjunction with Floradrain® FD 60. This system provides for a high level of water storage and for the drainage of excess water through the underlying channel system along what is a considerable distance. 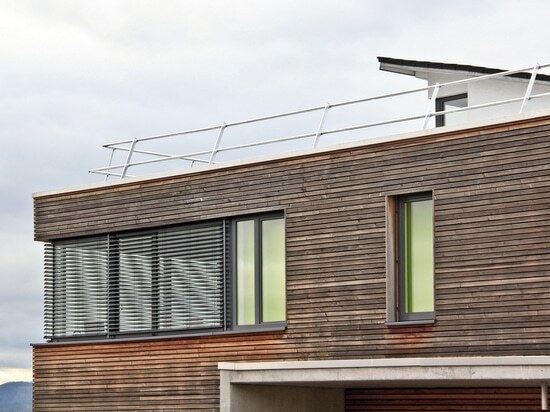 This multi-functional build-up provided also the right foundation for the intended surface areas on the roof. These areas are primarily pathways but due to the load-bearing capacity of the system build-up they can also be used for small maintenance vehicles such as a small road sweeper. Railings were required around the various atria and for the accessible area at the front edge of the building. 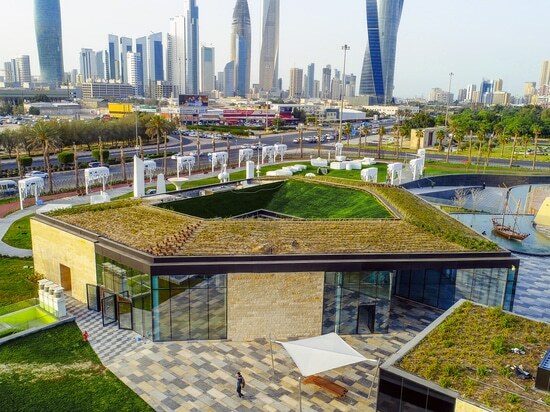 ZinCo provided an intelligent and structurally-advantageous solution for this: The guardrail base GB is integrated directly into the green roof build-up and is kept in place by the superimposed load. As a result, the railings were secured without the need to penetrate the roof, therefore eliminating any weak points in the waterproof membrane or thermal bridges. 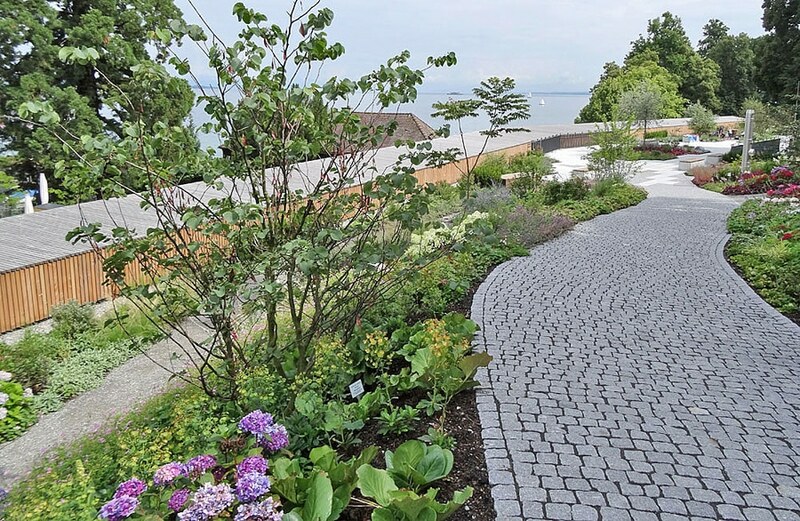 In line its annual motto for 2014, Mainau is opening up new vistas and is merging the surrounding landscape into the design of the parkland.